Thanks for sharing this amazing story. I too clung to the hope you expressed here while I waited 3 long months to pick up my daughter from a Chinese orphanage where she received minimal care for 11 months. Perhaps the intervention of angels is what allowed her to have the biggest, warmest smile even though she weighed 11 pounds at 11 months of age. Sue, how can I purchase a copy of Dream Catcher? It’s gorgeous. I am posting it on Etsy right now. I believe the angelic works behind the scenes of our lives more than we can imagine. I love this story. I,too, am an abuse survivor. My father abused me for quite some time. Yet, in spite of all the misery and pain, I knew that I would be alright. I never actually saw an angel, but I felt my angel. During each episode, I felt myself being lifted out of my body and I felt enveloped in an intense blanket of love. There was also a light that I could never see in the world. I haven’t seen it since then, but there is a comfort in knowing that it is there when I need it. I was never afraid to leave my body. It certainly was better than the alternative. Somehow, I know that my angel or angels were with me. Otherwise, I don’t think I would have survived. Today, I still know that my angels are here and that my God (Source, or whatever you would like to call it) is still here. I think more people experience the angelic than is known in common hours. Thank you so much for sharing your comforting story. Holy cow, Alisa. What a beautiful story. Thanks for sharing it. When I was in high school I wanted to believe in angels but didn’t think they believed in me. Now I know different. Sometimes the angels that appear are in the shape of dogs~~~~I’m a firm believer that dogs are some of God’s most special messengers. 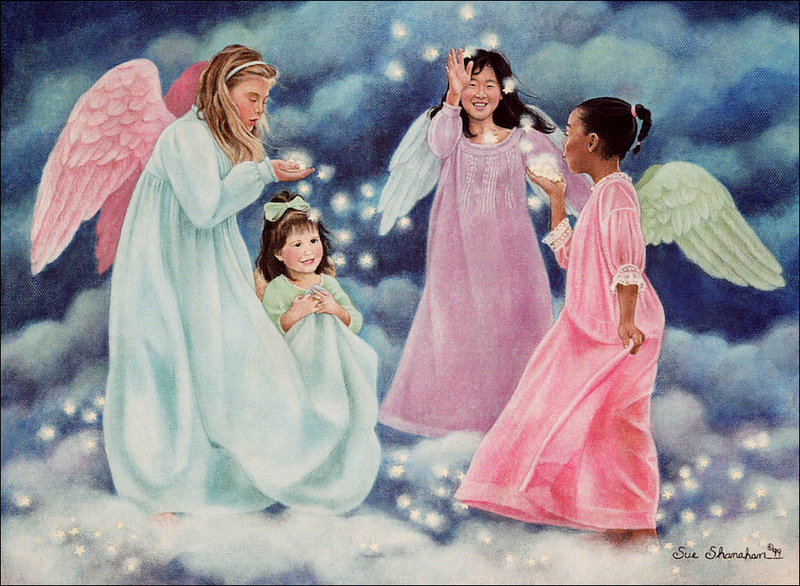 How healing all angels are to all those who are hurting and need comfort to know that eventually all will be well. I agree. Dogs are some of the most healing messengers I know. Sue, Thank you so much for sharing this story. I to believe in angles. I’ve never seen them but I have felt their presence and know of their protecting power. I have shared on my blog Traveling Grace, about our oldest son and how angles brought him home safe. I have also shared on my blog, Why I Must Forgive. It was learning to forgive after learning our youngest son was molested by a neighbor over a two year period. It was 6 years later before we knew. Our son was 8 to 10 at that time. He is now 35 and finely able to turn the emotional baggage over to God. After 2 failed marriages he decided it was time to fix himself with Gods help and stop depending on a wife to fix him. The piece I wrote on Forgiveness, he told me it was that, that made it possible to go on. No matter what we go through it can be used to help another heal. Keep spreading the message of God’s amazing grace. Whether we see them or not, I believe angelic helpers are everywhere. I am so happy to hear of your son’s healing. How blessed he is to have you as a mother. I had a young son, so different from the others. Infinitely gentle, deeply thoughtful and perceptive beyond his tender years, yet full of joy. Whilst his older siblings indulged in rough or boisterous play, after a time of joining in, he’d withdraw to a grassy bank near them, and just sit and watch them. I used to watch him watch them, and I’d feel a stillness within me, like I had entered his secret world, for a wee moment. One day, after months intermittent, he was hospitalized with an unknown illness. Being Catholics, we prayed desperately to St Jude to heal him.After a month, his doctors declared him on the mend. On our way bringing him home, we stopped at a St Jude’s church to give thanks. The kids were all asleep in the back of the car, heads lolling on one another. This little one of ours rested his head on one of his older siblings but with his back angled towards us. It was not at all hot in the car, but on his T-shirt, on the shoulder blades, we saw 2 distinct, perfectly formed ovals. They didn’t feel wet; neither were they oil marks. Puzzling over it for a while, we let it be and roused the kids and went into the church. I paused to pray thanks at a St Jude statue. As I prayed, I had the odd feeling that my prayer was being received but falling through a vacuum. I could not explain it. 5 days later, the angels came and took our little one home. The pastor who presided over our son’s service did not know us at all, and yet, his sermon stunned me because he spoke of things he could not have known of. But one things stayed with me. The pastor repeatedly referred to our son as an angel. It was not said as an endearment or to comfort us. It was as if the pastor knew something we didn’t. When we approached him the next day to ask how he could of known of the things he spoke about, he was very quiet, and gently told us that he didn’t know either. We understood then that someone had spoken through the pastor, someone from beyond this world. Several days later, very late at night, unable to silence the sobs in my throat, I left our bedroom to go downstairs to weep by myself. At the foot of the stairs, my eyes caught an image of Our Lady of Mount Carmel on a Catholic calendar on the wall. As I gazed at her holding her baby, imagining mine she was holding, I heard these still words in my heart: Those marks you saw on him were the beginnings of angel wings. Do I believe it? Yes, I do, but not because it comforts me. I believe it because I know it’s true. An angel took on human form for two years, seven months and twenty four days to let us know he was our Guardian Angel who would guide us through the treacherous path ahead. Because we loved him beyond words, when we lost him, we searched for him in all things holy and reverent. Our search purified us, lifted the scales from our eyes to see the errors of our ways, and it saved us before we lost God forever. I am thankful to God for the gift of this angel, but like any mother, I’d give anything to have my boy back. Thank you for sharing your story. It was achingly beautiful. How lucky are you to have met your Guardian Angel while he walked on earth. Blessings of the season to you. Sue, I’m going through a healing process now – healing from decades of emotional and spiritual abuse by my mother. So many big and little things have happened in the course of this healing journey which began in 2012. Yesterday, I stumbled upon your blog. Seeing your paintings of angels that look so much like children we might have had and loved and then bade farewell to, you touched something, somewhere so deep within me. Suddenly, the evening here became more golden and joy rode on the breezes that blew through our home. I know that some healing has come my way thanks to your beautiful angels. Sue, thanks so much for sharing your God-given gift. Given what you had gone through with your own mother and father, you could have so easily chosen bitterness and despair and self-pity, but you chose to allow God to heal you, and now, you’re actually sharing that Healing Light with others. Wishing you and your lovely family a blessed Christmas too.